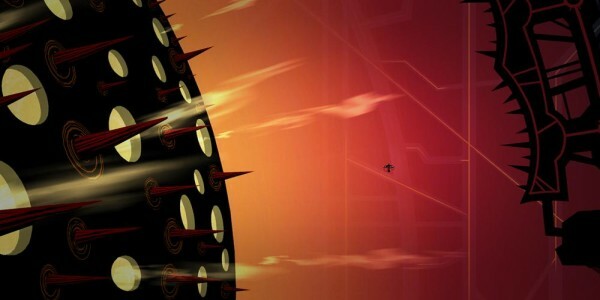 Insanely Twisted Shadow Planet is the unique, genius and highly stylised open-world puzzle platformer from Fuel Cell Games. Although first appearances suggest that ITSP is just another platformer, once you start playing, it becomes apparent that it is much more than that. However it still remains as simple as the standard, in controlling respect anyhow, the tutorial lasts under a couple of minutes as you learn to fly, and hotkey your attachments. After you’ve learned the basics, you progress into the unusually open world. Starting off a little slow, just introducing you to the fundamentals of the game, how to shoot, change attachments, a simple puzzle or two, and giving you your first taste of the vast array of enemies you’ll encounter on your journey. Once covered, it really drops you in at the deep end, leaving you unguided and alone in the twisted abyss. It’s fairly strange for a platformer to have such an open world, but ITSP pulls it off surprisingly well. The map covers a large area, but keeps certain sections locked off until you complete, or gain, a certain thing. For example, defeating the ice world boss will unlock the mechanical world area. Or a certain door will require the tractor beam attachment to open.Now, it’s not necessary to go into these areas, but they will provide you with upgrades for your ship, as well as the games collectables: artefacts. You can revisit any, and all areas behind you, but unfortunately, there’s no teleport/quick travel system in place, so it can be very tedious navigating right back to the beginning of the map just for one collectable you may have missed. And it does take a very long time. This isn’t going to affect you if you don’t plan on achievement hunting, or just collecting everything, sticking to the main path and completing the game without collecting anything is just as fun, and less annoying. 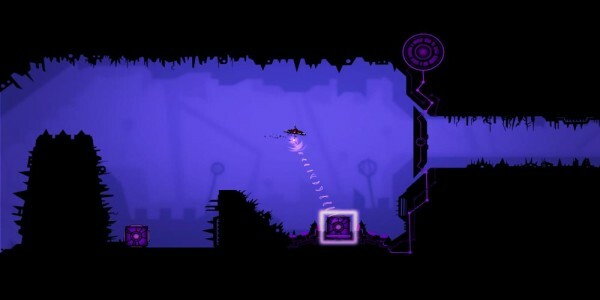 The games style is extremely simplistic, focusing on mainly black, and other dark and gritty colours. You will see the odd bright colour or two on your exploration, but they come few and far between. This is not a bad thing; at all. It really adds to the beauty of the game, and the overall feel. As you fly through the map, you can’t help but love the art style used. Everything form your ship, to a simple block of ice has been greatly thought through, and each and every item, enemy or environment you see ties in with the theme, nothing feels out of place. Even the occasional 3D model somehow fits in with the games 2D nature. 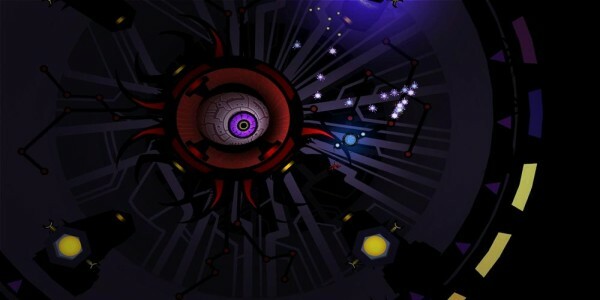 Throughout the game, there’s about 6 different areas you’ll explore, each with an ending boss, and usually a new tool for you to acquire. Following standard platforming law, the tool you collect is the heavy focus of the next area, requiring you to use it to solve the upcoming puzzles, and defeat the area’s enemies easier. With 6 different tools for you to collect (aside from the beginning two) you soon learn to combine each one, always coming up with different ways to defeat the enemy. Puzzles are probably the main element of ITSP, offering a new, and often challenging puzzle around each corner. Utilising your tools is a must, and finding the right combination can take a little time, but vital to progress. These add a fun and challenging element into the mix, and make ITSP much more than the average. Boss fights are, for me, the most fun and interesting part of the game. With one for each area, they act like one big puzzle. You must find their weakness, and exploit in using any of the tools at your disposal. It takes time to defeat them, time to figure out how, you’ll without a doubt find yourself dying a few times before you find the perfect solution. A successful defeat results in a new area unlocking, and a new tool at your disposal. Overall, Insanely Twisted Shadow Planet is one of the most innovative, brilliant and truly gorgeous platforming games I have ever played. I just can’t help shake the feeling that it feels like just an expanded flash game, but a damn amazing one at that. ITSP is yet another amazingly strong addition to this years Summer of Arcade, and a title well worth your money. It looks great. I love the exploration in Metroidvania style games and the art in this is gorgeous. I hope to be able to pick it up at some point. good review, hoping I win because otherwise I’ll have to wait for a sale! Nice, I’m glad to hear this might be another hit, I thought it looked cool and had the best name of the summer. Glad I could finally log in :> The review has me even more excited about this game — I thought it was just a cool platformer/shooter, but I’m intrigued by the puzzle aspect and the amazing graphical style. I love a good puzzle game. So far, this seems to be the best SoA, as far the the released titles go. From the screenshots, this game looks like LIMBO and Space Invaders ran off somewhere and had a baby, but from what you wrote gameplay wise, this seems to be in a league of it’s own. A platforming puzzle shooter must have been a daunting task to pull off but from what you have said they must have really nailed it. It’s starting to seem like we may be entering the “Golden Age” of XBLA games. The trial was quite different than I expected. I ignored all SoA games until SoA actually started. So I kinda expected this to be more like Shadow Complex, you know with a guy running around instead of flying. It’s a refreshing take on it so it’s a pretty interesting game. Loving the summer of arcade so far, every title seems to be scoring 9/10. And we have not even got to Fruit ninja Kinect yet. Makes a change for a reviewer to say the bosses are nearly the best part of the game, in my experience there usually the biggest pains!!! Good luck everyone, retweeted @chumush. I’ll say one thing,Microsoft has been slacking on 1st party retail games lately,but the last 2 summer of arcades have been amazing. Great review, and thanks for the contest. Good review here. I was reading Gamespot’s review and it threw me off how they kept labelling the game as a Metroidvania title. Sounds like it’s right up my alley, color schemes like limbo with a little bit of undergarden in there, the graphics look very good, puzzles which I love and a title that says it all. Great review, If I don’t win it from you I’m hoping to get some points to pick this game up for sure. Thanks for the contest! I knew the game would be good vut after reading your review I think it’s even better. Thanks for the giveaway! My wallet is taking a beating with all these great Summer of Arcade titles. Thank you for this contest!!! Judging by the demo it’s pretty fine. Thank for the contest, by the way. Man this game looks awesome! Thanks for the contest! ITSP is 60 FPS of pure awesomness! If only Fruit Ninja Kinect wasn’t part of the SoA 2011 this would have probably been the first perfect SoA for me.